This week in fashion, Justin Bieber launched his clothing line Drew House, Zara changed their logo, Aerie’s feel-good mission welcomed five inspiring additions and Gucci continued the fight against gender inequality. Find these stories and more as we reveal the top international fashion news of the week. 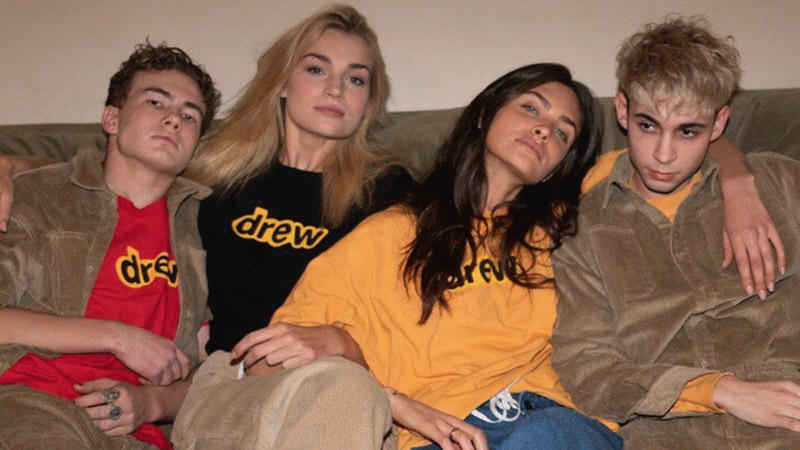 Bieber has launched his clothing line, Drew House, the millennial kid’s answer to casual wear, with a twist. “Drew house is a place where you can be yourself. blah blah blah blahsdbksjdfhl wear like you don’t care. come chill. k. bye,” the brand says on its website, alongside moody pictures of 20-somethings in the brand’s pieces. So what is the Drew House aesthetic? Think skater boy corduroy as well as pops of mustard, red and yellow. This sits alongside a yellow smiley face whose smile has been replaced by the word Drew. Justin and his wife have already been seen out and about in Drew House, with the couple donning sweatshirts and slippers by the brand. Justin Bieber even showed off a range of expensive looking Drew House necklaces that seem to be laced with diamonds. Everyone’s go-to for cool-girl dressing, Incu, has launched its own in-house label. Aptly named Incu Collection, the new line will join the ranks at all six of Incu’s retail stores across Australia, as well as on Incu.com. The pieces are being praised as a contemporary twist on your regular wardrobe mainstay, with a strong penchant for functionality and hence wearability. “We want Incu Collection to be approachable and accessible for the wide spectrum of our customer base. With this in mind the aesthetic is one that’s easy, sophisticated and classic, with nods to current trends but never solely focused on one single look or vibe,” said designer Ben Pollitt. Gucci has announced the latest venture of its Chime for Change campaign, through which it hopes to continue to tackle gender inequality. The project will support six organisations across the globe that help with the fight for gender equality, with support from Hearst Magazines, Facebook, the Kering Foundation and the Bill & Melinda Gates Foundation. The Italian fashion house launched Chime for Change in 2013 alongside Beyoncé and Salma Hayek to unite the voices speaking out for gender inequality globally. They have managed to fund more than 425 non-profit projects, directly benefitting 570,000 girls and women across the globe. In this latest chapter of the campaign, Chime for Change will be supporting six new projects. This includes Equality Now, Global Fund for Women, Ms Foundation for Women, UN Women, Vital Voices and Women Deliver. Gucci has also partnered with Italian visual artist MP5 to create the new Chime for Change campaign identity. It will be seen on Gucci’s Artwalls in London, Hong Kong, New York, Milan and Taiwan. It features silhouettes of unidentifiable human figures that are not defined by gender or any other labels. Aerie is expanding its family; the affordable lifestyle brand has become famous for its #AerieREAL Role Model campaigns. They celebrate ladies from different careers and backgrounds in an intimate and unretouched photo shoot. For the Spring 2019 reprise, Aerie has welcomed five industry-changing women. This includes actress and body-positive activist Jameela Jamil, author and talk-show host Busy Philipps, Emmy-winning actress Samira Wiley, para-snowboarder Brenna Huckaby, and YouTuber Molly Burke. The five women modelled alongside existing Aly Raisman, spokeswomen Iskra Lawrence and Cleo Wade in the breezy campaign. In a media release, Busy said the images parallel the messages of self-love she tries to impart to her daughters. Meanwhile, Jameela applauded the label for constantly taking risks. “I just want to stop people from feeling the way that I once felt by being beaten up by imagery and messaging that wasn’t real and wasn’t demonstrative of what the real world is,” she said. In a feel-good video, the eight women as mentioned share the ways in which they are powerful. The world’s biggest fast-fashion label has a whole new look. Spanish retail giant, Zara, has revealed their first major logo revamp since 2010 to mixed reactions. The new-look logo sees the brand’s four letters interlocked in a flowing cursive font. It shows the Z blending into the A and the curves of the R crossing into the final A’s territory. Consumers have taken to social media to express their confusion as to why Zara has taken on a “squashed” look.